There are several characteristics which can be seen on most of the Poch figures. These characteristics can of course also appear on other figures which are not produced in Spain. It’s important for me to stress that not every figure with dents, melt-marks, “dripped” paint or faded/discolored hands is assumed to be a POCH variant. Poch figures are rare and it’s very unusual and nearly impossible to find those outside of Spain. The characteristics presented here do actually help identifying Poch figures and seem to be a part of the way Poch/PBP produced his toys in the early 80’s. While pale hands are normally a sign of degradation, in the case of the Poch figures it isn’t. We already know from the later “PBP” figures that a pale face can be a typical indication of a spanish produced figure. It’s also important to note that most faded Kenner produced skin colors look quite different compared to the produced pale hands from “Poch”. They are more yellowish because mostly the red pigments (as part of every skin color) start to fade first which gives the hands a more yellow look, that yellow can also fade over time which results in a grey look. As you can see in the pictures above all “Poch” produced pale hands are noticeably similar in appearance. The little differences mostly depend on the thickness of the color. The skin color is often sprayed very thin on “Poch” figures. This fact results in an optic phenomenon: the colored plastic “shines” through the paint and does affect the optical appearance. A good example is the Bespin Security Guard. His hands always seem to be more bluish or look „cooler“, then the other pale hands, because of the blue plastic shining through. I was lucky enough to find three “Poch” figures of the same character. I think the picture above will finally bury all the degradation assumptions on these. As you can see all three look exactly the same. You can also see a „touch-up“ made by factory on the one on the far left. This also happens very often to “Poch” figures. A. It only appears on the limbs (“soft” plastic), never on a torso (“hard” plastic). B. It was only found in black or white/pale sprayed areas. C. The thickness of the paint seems to affect this phenomenon. It never occurs in thinly sprayed areas. We can now assume it’s just the result of “poor quality”, i.e. paint that was not thoroughly mixed or not sprayed on the figures correctly. But the fact that it seems to only appear on the parts made out of “softer” plastics leads me to another theory. 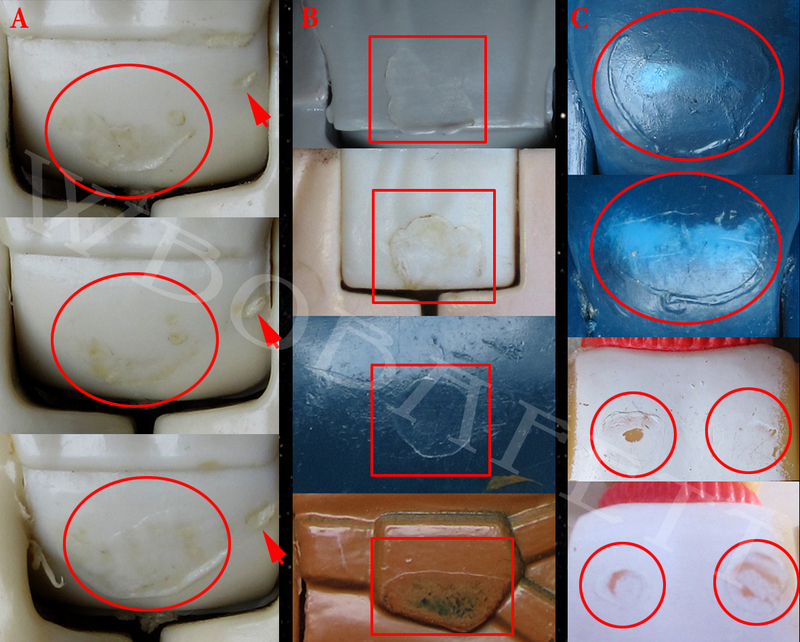 It could be because of the adhesive agent from the paint being incompatible with the “softer” plastics. You may have noticed this yourself when you use the wrong spray-colors on certain surfaces. It may work if you spray it thin, but the thicker you get, the more irregularities occur. In addition soft plastics can build a “slippery“ surface after cooling, which can also be a factor for the paint building irregularities. In the pictures below you can see some of the examples that I have found on “Poch” figures. As far as I remember this phenomenon was discovered first on the Rebel Commander with “black” boots. Mike_Skywalker noticed years ago that this figure always seems to have some dents on its backside. He asked several other collectors if their examples of this figure also exhibited the same marks and collected pictures to confirm his theory. JaviSWSpain later noticed that this also can occur on other Spanish produced figures and that this phenomenon could be an identification point to spot “Poch” figures. A: These look like imprints from a tool during assembly. The damage seems to be a result of heat and pressure. To me it looks like the tool was probably “hot” and that is what caused the damage during figure assembly. B: These all do appear to be plain flat marks on the exposed parts of the figures back. It looks like the figures were just laid down on a hot plate, for whatever reason. C: These look like only the paint on the back was damaged. It also looks like the paint was still kind of “wet” while this happened. The combination of pressure and a not fully dried paint leads to an embossment around the place where the pressure was executed. This looks quite different compared to a simple rub. These marks can appear on Poch figures, but of course not all marks like these indicate a Poch figure. They are definitely factory made and a sign of poor quality. Identifying a true Poch figure is all down to a combination of where they are found, the paint used, the actual figure and of course the poor quality during production. Another sign of the poor quality from the Poch figures is that really a high percentage of these figures have „spotty limbs“. Fungi really seem to like the Poch figures which may result from different mixed plastics compared to the Asian producers. We should keep in mind that all these signs of poor quality are maybe the reason why PBP changed the whole production process in the later period, or maybe even Kenner forced them to do so.